This is the fourth instalment of the barbecue season essentials. In previous posts I have posted recipes for chipotle ketchup, dijon and Oktoberfest mustards, and mayonnaise. So this recipe completes the "set." I don’t know about you, but my favourite combo for both burgers and hot dogs is onions, mayo and relish. Maybe cheese too, if I'm feeling adventurous... So having relish is a necessity for me. 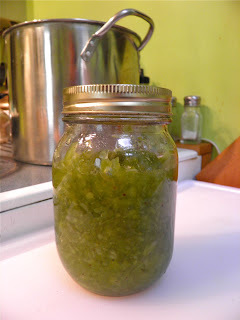 So here’s my relish, the fourth of your staples to have on the picnic table. Relish is a bit of a particular taste as different recipes have different tastes. For me it has to be tart yet sweet, firm and green. If it fails on any of those counts it won’t stay in my fridge. 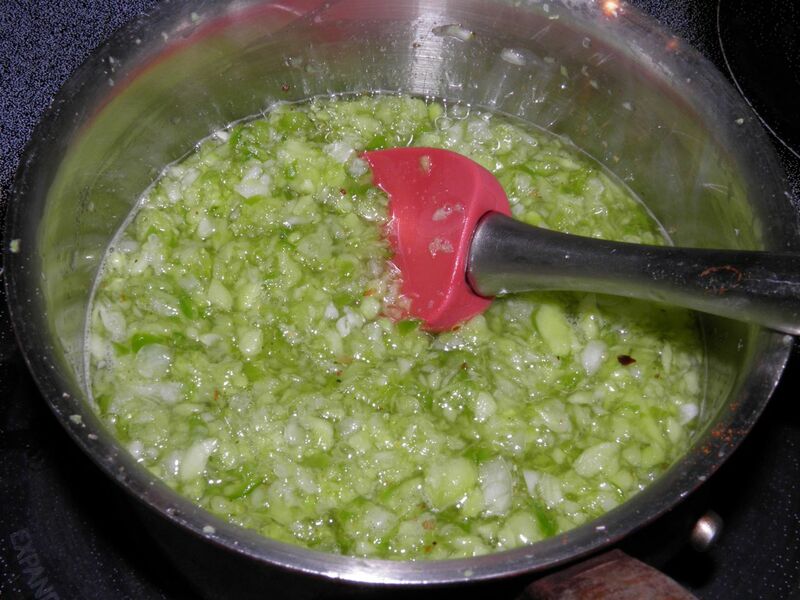 Homemade relish is notoriously pale. That is because most recipes require the cucumber to be peeled. The reason is that the peel is tough compared to the flesh. This recipe uses an English cucumber because I find them firmer than the usual local garden cucumbers which helps keep their shape after cooking. 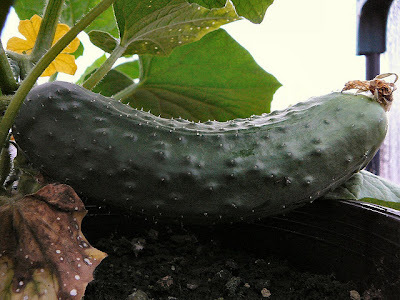 If you wish, feel free to just wash the cucumber thoroughly and then chop with skin on. 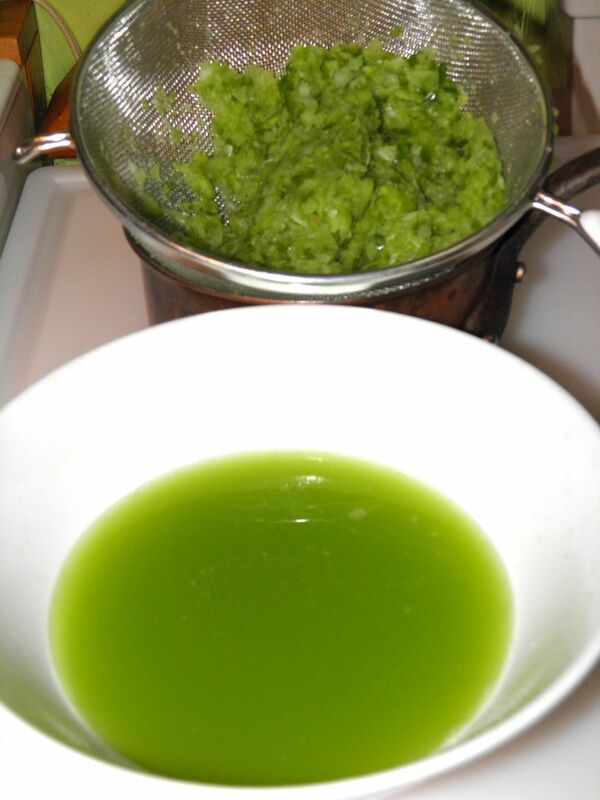 I didn't want to take the chance of tough skin so I peeled mine, and substituted 2 drops of green food colouring. It is very close to the colour of "brand name" relish. You can probably even fool the kids. Cooking in the vinegar, sugar and spices. An important step to not leave out is the squeezing of the vegetables after they have been leached of their liquid with the salt. Be merciless. You’re taking as much water out as you can so the vinegar, sugar and spices will be absorbed back in while cooking. If you don’t your relish will end up being runny, and who likes runny relish? Cut all the vegetables into medium sized chunks. Place the celery and onion in a food processor and chop until the desired size. Err on the small side since this is for relish, but use your common sense. You don’t want it puréed. Repeat with the peppers and then the cucumber. Combine all the chopped vegetables in a non-reactive (glass or ceramic) bowl. Add the salt, toss well, and let sit for 2 hours. You can put a bowl or plate on top to help press out the liquid. Bring the vinegar, sugar and pickling spice to a boil in a large saucepan. Add the vegetables and simmer for 10 minutes. Add the green food colouring if your vegetables are too pale for your liking. Two drops of green made the mixture very close in colour to store purchased relish. Pour into a jar and process in a hot water bath for 10 minutes. Let cool on the counter until the canning top pops down to prove your airtight seal. Makes a scant 1 pint. The recipe can be scaled up to larger quantities.